This cute koala was meant to be one of the “lucky ones” … but having escaped the worst of North Stradbroke Island’s firestorm using his natural instinct to seek safer ground, he was mauled by domestic dogs near Dunwich. The dogs – family pets – were roaming free despite the fact that, by law, they were supposed to be restrained with a leash, or at least enclosed in a yard. Unfortunately Ziggy – as he was affectionately named – is now a statistic. He had to be euthanised despite the best efforts of wildlife carers to nurse him back to health. Today, as North Stradbroke continues to recover from the two-week fire sparked by lightning on December 29, wildlife carers have joined with Traditional Owners to tell Ziggy’s story in the hope both residents and visitors will do their bit to help in the healing of Naree Budjong Djara (‘My Mother Earth’) and its beautiful surrounds. Redland City councillor Craig Ogilvie – whose Division 2 takes in North Stradbroke – said dog attacks were an all-too common problem on the island but it’s now even more critical for owners of domestic pets to ensure native fauna has a fighting chance. “This is nothing more than what’s required by law but it’s even more crucial right now because a lot of wildlife has moved to new habitat and is highly vulnerable to attack,” said Cr Ogilvie. Council’s animal management officers will have an increased presence on the island at this critical time to help ensure dogs are kept on leashes. Fines of $220 apply if dogs are off-leash out of designated areas. Quandamooka Yoolooburrabee Aboriginal Corporation (QYAC) chief executive Cameron Costello urged people to “care for country” by respecting flora and fauna when visiting Straddie. “We encourage people to come and holiday, to enjoy our beaches and everything else we have to offer … but also to be mindful that we are in recovery mode,” said Mr Costello. “We ask people not to wander from established tracks so our plants can regenerate and seeds can germinate, and our cultural sites are not disturbed. Wildcare Straddie spokesman Greg Grimmett said uncontrolled domestic dogs caused horrific and heart-breaking injuries to koalas, kangaroos, wallabies, kookaburras, curlews and lizards, to name just a few. “A significant number of injuries we deal with are a result of domestic dogs not being under control,” said Mr Grimmett, who is also the convenor of the Stradbroke Wildlife Forum. “People particularly should keep in mind that off-leash areas do not mean people do not have to have their dogs under control. Mr Grimmett said pet owners could also ensure accommodation providers claiming to be pet-friendly were also “wildlife friendly”, and offered enclosures to protect native flora and fauna from wandering pets. “We get too many animals that are torn to bits because of dogs – a bit of common sense would go a long way,” he said. Redland City’s Acting Mayor and Local Disaster Recovery Committee chairman Alan Beard said most of the public areas on Straddie – including all campgrounds – had now been re-opened although some tracks remained closed for public safety. “Most of the most popular areas remain just as beautiful as they were before the fire,” he said. “Much of the fire burnt in inaccessible areas. “There’s a multi-agency effort across all tiers of government to help with the island’s recovery and we are working closely with the Traditional Owners,” he said. “We just ask people to use common sense and do their bit to help in the recovery,” he said. Redland City’s Animal Management Committee spokeswoman Cr Wendy Boglary said Council officers traditionally stepped up their presence on the island for the holiday period and this would continue to reduce risks to wildlife and the public generally. “Home Beach is the only off-lead beach area as well as Skatebowl Park at Dunwich between the skatebowl and the fenced area at the eastern end of the park,” she said. 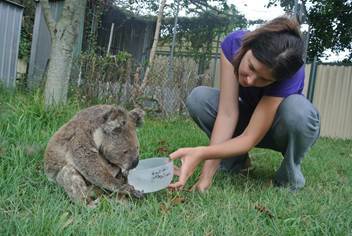 “It’s important that everyone does what they can to help Straddie heal. Report injured wildlife to Wildcare Straddie on 0407 766 052. Posted in Disaster management and tagged dogs, environment, fire management, North Stradbroke Island, Straddie.